Sources in the Papua New Guinea government have revealed that it will not only be waste from the Ramu nickel mine that will be discharged into the sea off the coast of Madang but also the waste from foreign mining operations. The Ramu mine owners, Chinese MCC and Australian listed Highlands Pacific, have an agreement that allows them to import nickel bearing ores from other, overseas mines, for processing at Basamuk. The waste from the processing of this ore from overseas mines will be dumped into the sea through the same pipeline as the Ramu mine tailings. This helps to explain why the harbour facilities that have been built at Basamuk are so extensive. They will handle not just the export of refined nickel and gold but also the importation of millions of tons of nickel ore from overseas mines. Many local landowners are already challenging the waste dumping plans of the Ramu nickel mine through the courts, and they currently have an injunction in place stopping any waste dumping until their legal action is heard. But what they probably don’t know is that their seas stand to be polluted not only by the 5 million tons of waste that the Ramu nickel mine will create every year but by untold millions of tons of further waste from other mine sites which could be anywhere in the world. In another twist to the story, the Chinese government is currently funding the construction of Papua New Guinea’s first Special Economic Zone in Madang. The zone will allow factories to import and export material duty free and the Basamuk refinery would seem to be a likely beneficiary of SEZ status. China has already financed the building of SEZs in Africa, a policy backed by the World Bank – which co-incidentally is helping PNG to draft its SEZ laws…. So, not only will the people of Madang have to suffer the consequences of the waste from the Ramu nickel mine AND untold foreign mines being dumped into their seas, it seems the people of PNG could be denied the benefit of any tax revenues because the Basamuk refinery will be declared a tax free Special Economic Zone! Highlands Pacific to make a small fortune from Frieda mine – but will Papua New Guinea get a similar return? Highlands Pacific is expecting to make a small fortune – at least US$ 127 million a year – from its share in the proposed Frieda river mine in Papua New Guinea. But will the people of PNG get a similar return? Highlands $127 million a year will be a pure cash profit and will come from just its 16.6% stake in the mine. Well, as you can see, they come straight from the horses mouth. These predications were part of a presentation given by John Gooding, Managing Director of Highlands Pacific, earlier this year. And the actual figure could be even higher as $127 million is based on a copper price of $2.20/lb and gold price of $800/oz. 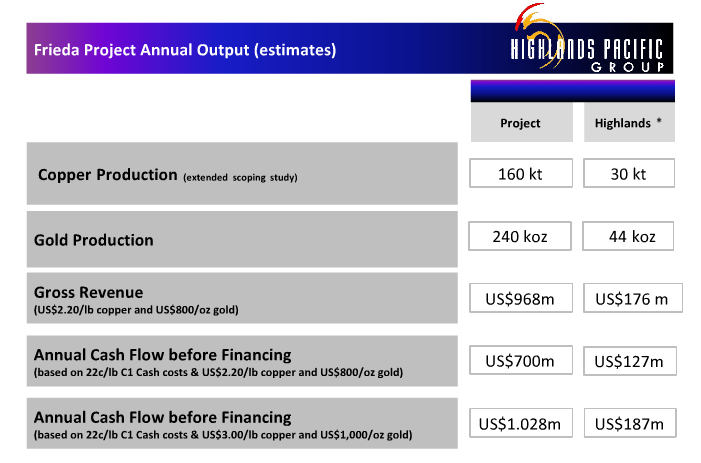 At prices of $3 and $1000, Highlands cash profit will jump to $187 million a year – and the spot prices for copper and gold are currently about $3.75 and $1350 respectively – no wonder Mr Gooding is smiling these days! These figures show that if the government insists on a 30% stake in the mine for the people of PNG that could be worth at least $250 million a year – think how many teachers or nurses could be paid with $250 million a year? But will the government insist on a 30% stake, or will it sell out our interests just as it did with the Ramu nickel mine? WEST coast central New Ireland landowners will ask the Supreme Court to stop any deep-sea mining in the area until the current mining laws governing sacred fishing grounds are properly interpreted. “The state has resolved that we are not owners of the sea.The state seems to think that ownership ends at the waterfront,” he said. Is Ken MacDonald telling porky pies about the Ramu mine? Ken MacDonald, Chairman of Highlands Pacific, which holds a stake in the controversial Ramu nickel mine in Papua New Guinea, has been telling what could be porky pies (lies) about the mines marine waste dumping plans. The mine waste will “not be toxic” he says in a radio interview. Ramu nickel could be the first mine of its type anywhere in the world not to have poisonous chemicals in its tailings? But what about the arsenic, ammonia and heavy metals, Mr MacDonald? And surely, just the 5 million tons per year, of what you describe as “essentially mud”, will be pretty toxic for what ever poor organisms it lands on top of? 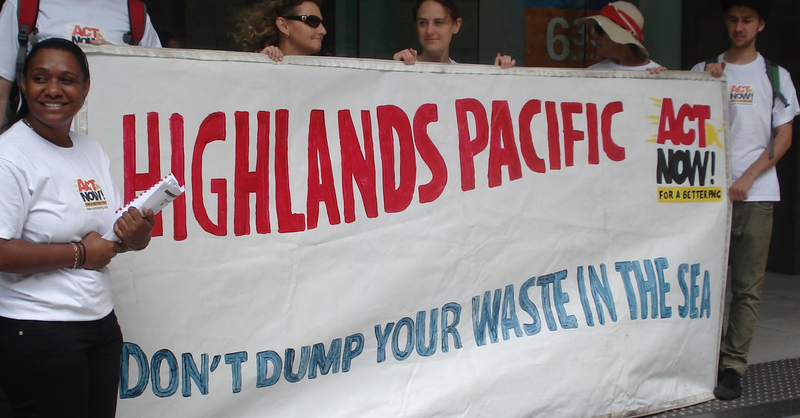 Has Highlands Pacific ensured their free informed prior consent to the mine and its marine waste dumping? No! Mr MacDonald should stop treating us like the dumb-asses he clearly thinks we are! I am Reuben, the Interim President of Union of Watut River Communities. An organization that is representing the people along the Watut River where the Hidden Valley Mine is operating. Morobe Mining Joint Venture (MMJV), the company operating the mine, is owned 50% by Newcrest Mining(Australian based) and 50% by Harmony Mining (South African based). There is already a huge environmental damage to the river system. Mine run-offs and overflows are allowed directly into the Watut River system. The River was most importantly known for its white water rafting and is regarded one of the most fast flowing river within the Southern Hemisphere. Tourist all over the world have been visiting the river. All these potentials are now gone! People (children, men, women and old people) are getting rashes due to the pH and alkalinity variations from the river. Food crops are not giving good yields, the alluvial miners are not getting much as they used to before. The silts are covering the once fertile top soil for gardening and the river banks are overflowing and flooding gardens. The river itself is very dirty/murky and filled with contaminated sediments daily…. I am very keen to at least raise this awareness when the 2010 Mining Conference is held down in Sydney between December 6 – 8, 2010. Due to financial difficulty, I cannot make it. Is there any way we can get all the Papua New Guineans living and working within the vicinity of Sydney to mobilise and put-up some bill boards or placards about the “unsafe, unethical, immoral acts”, that are being caused by those mining giants??? Just a peaceful protest because the PNG Prime Minister will also be there. If more information is needed, I will try to supply. Have a read and let me know your thoughts. Your help in anyway would greatly be appreciated. The National court has still not set a trial date for the dispute over plans for the Ramu nickel mine to dump millions of tons of waste into the sea. The date was to have been settled yesterday, Friday, in a special court hearing, but lawyers for the State of Papua New Guinea suggested that before any trial happens there should be an attempt to settle the matter through arbitration. This did not seem to please the mine owners, Chinese MCC and Highlands Pacific, who cannot begin mine operations until the legal challenge by local landowners is settled as there is currently a court injunction stopping any waste dumping. Lawyers for the companies wanted the court to set a trial date for January. Meanwhile the plaintiffs, all landowners who fear the environmental damage from the waste dumping, pointed out to the court that the procedural steps that need to be completed before a trial can be fixed have not yet been completed. In particular the State has yet to file its defence to the plaiantiff’s claim. With no agreement between the parties, the court decided to adjourn its deliberations for another week and has invited the State to file an application for Alternative Dispute Resolution and the mine owners to file an application for directions for an expedited hearing. ACT NOW! community members took to the streets in Brisbane today to deliver more than 500 protest letters to the directors of mining company Highlands Pacific. Highlands Pacific is a part-owner of the Ramu nickel mine in Papua New Guinea that plans to dump millions of tons of toxic mine waste into the sea – a practice that would not be permitted in Australia. ACT NOW! members are also concerned that Highlands Pacific has not condemned human rights abuses against landowners concerned about the mines impacts. A group of landowners currently have a court injunction stopping the Ramu dumping going ahead but the plaintiffs have been subjected to violence, threats and other intimidation. Highlands Pacific is not the only mining company on the radar for ACT NOW! Newcrest Mining is facing a legal suit over the pollution of the Watut river by waste from its Hidden Valley gold mine. The pollution has caused vegetation die-back and flooding and has destroyed landowners gardens. While Newcrest has admitted sedimentation problems in the river it has not commented on allegations of toxic acidification and consequent health problems for local people. Meanwhile, Marengo Mining from Perth is also planning to dump the waste from its Yandera copper and gold mine into the sea. This is also provoking concern, not least because the Yandera mine is only a few kilometres from the Ramu mine and will dump its waste into the same area of sea. Marengo is also under fire because it has signed a partnership agreement with Chinese Nonferrous Metal Industries which has a very poor environmental and human rights record in Africa. CNF is also the pioneer of Chinese funded Special Economic Zones in Africa and the Chinese are currently funding a similar project in PNG. Special Economic Zones are best known for their sweat-shop style factories, environmental problems and workers abuses.